Tranquil’s entry into the low power home server arena, the T7-HSG, is an intriguing look at the way a home server should be built. The server features a unique fanless (convection) based cooling system, a Gigabit LAN port, 4 USB ports and an Intel dual core Atom 330 processor running at 1.6 Ghz. Power consumption is rated at 33W for the stock configuration, which comes with 512 Mb RAM an a 500 GB hard drive. Upgrade options include RAM up to 2 GB or a 1 TB hard drive. The stock server comes with Windows Home Server pre-installed, but can also be ordered without an OS, giving the end user the choice of installing an OS (and a £50 discount) . The T7-HSG is primarily designed for desktop mounting, although brackets are available for wall mounting. Four USB2.0 ports allow the end user to seamlessly add peripheral devices such as additional storage capacity, a real plus. The server also comes equipped with PS2 keyboard and mouse ports along with an RS-232 serial port. The dimensions of the T7-HSG is diminutive (22.4 cm x 23.2 cm x 5.7 cm) and the weight comes in at about 4 kg. But don’t let it’s small size fool you. There’s a lot of horsepower packed in the quiet case. 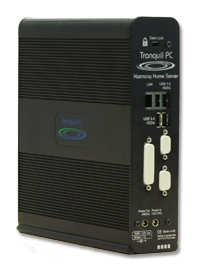 The current price from Tranquil for this low power server is £334.88.